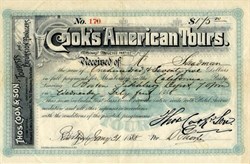 Beautiful Membership Certificate in the California Party from Cook's American Tours issued in 1888 to travel First Class for $175. This historic document has an ornate border around it with a vignette of the company's name and a light underprint of a ship, cabin and train. This item has been hand signed, Thomas Cook & Son, and is over 124 years old. Thomas Cook (22 November 1808 � 18 July 1892) of Melbourne, Derbyshire, England founded the travel agency that in 2007 became Thomas Cook Group. The first-ever excursions Panels from the Thomas Cook Building in Leicester, displaying excursions offered by Thomas Cook Cook's idea to offer excursions came to him while waiting for the stagecoach on the London Road at Kibworth. With the opening of the extended Midland Counties Railway, he arranged to take a group of 540 temperance campaigners from Leicester Campbell Street station to a rally in Loughborough, eleven miles away. On 5 July 1841, Thomas Cook arranged for the rail company to charge one shilling per person that included rail tickets and food for this train journey. Cook was paid a share of the fares actually charged to the passengers, as the railway tickets, being legal contracts between company and passenger, could not have been issued at his own price. This was the first privately chartered excursion train to be advertised to the general public; Cook himself acknowledging that there had been previous, unadvertised, private excursion trains. During the following three summers he planned and conducted outings for temperance societies and Sunday-school children. In 1844 the Midland Counties Railway Company agreed to make a permanent arrangement with him provided he found the passengers. This success led him to start his own business running rail excursions for pleasure, taking a percentage of the railway tickets. With John A Mason Cook, he formed a partnership and renamed the travel agency as Thomas Cook and Son. They acquired business premises on Fleet Street, London. By this time, Cook had stopped personal tours and became an agent for foreign or domestic travel. The office also contained a shop which sold essential travel accessories including guide books, luggage, telescopes and footwear. Thomas saw his venture as both religious and social service; his son provided the commercial expertise that allowed the company to expand. In accordance with his beliefs, he and his wife also ran a small temperance hotel above the office. Their business model was refined by the introduction of the 'hotel coupon' in 1866. Detachable coupons in a counterfoil book were issued to the traveller. These were valid for either a restaurant meal or an overnight hotel stay provided they were on Cook's list. In 1865, the agency organised tours of the United States, picking up passengers from several departure points. John Mason Cook led the excursion which included tours of several Civil War battlefields. A brief but bitter partnership was formed with an American businessman in 1871 called Cook, Son and Jenkins; however after an acrimonious split the agency reverted back to its original name. A round the world tour started in 1872, which for 200 guineas, included a steamship across the Atlantic, a stage coach across America, a paddle steamer to Japan, and an overland journey across China and India, lasting 222 days. In 1874, Thomas Cook introduced 'circular notes', a product that later became better known by American Express's brand, 'traveller's cheques'. Conflicts of interest between father and son were resolved when the son persuaded his father, Thomas Cook, to retire in 1879. He moved back to Leicestershire and lived quietly until his death. The firm's growth was consolidated by John Mason Cook and his two sons, especially by its involvement with military transport and postal services for Britain and Egypt during the 1880s when Cook began organising tours to the Middle East. By 1888, the company had established offices around the world, including three in Australia and one in Auckland, New Zealand, and in 1890, the company sold over 3.25 million tickets. John Mason Cook promoted, and even led, excursions to, for example, the Middle East where he was described as "the second-greatest man in Egypt". However, while arranging for the German Emperor Wilhelm II to visit Palestine in 1898, he contracted dysentery and died the following year. John Mason Cook's sons, Frank Henry, Thomas Albert and Ernest Edward, were not nearly as successful as their father and grandfather at running the business. Despite opening a new headquarters in Berkeley Square, London in 1926, ownership of Thomas Cook and Son only remained with the family until 1928, when it was sold to the Compagnie Internationale des Wagons-Lits. During the 1930s the travel agency changed its focus from tours to Egypt and Palestine. Indeed the company was a principal employer in Egypt, involved in shipping, transport and touring operations. After the outbreak of World War II the Paris headquarters of the Wagons-Lits company was seized by the occupying forces, and the British assets requisitioned by the British government. In 1941, the centenary of the company, Thomas Cook & Son Ltd. was sold to the four major railway companies with the aim of expanding it further. The company was nationalised in 1948 as part of the British Transport Commission. In the early 1950s the company began promoting 'foreign holidays' (particularly Italy, Spain and Switzerland) by showing information films at town halls throughout Britain. However they did not sell cheap package holidays, which included transport and accommodation, a decision costly to the company. The company went further into decline, and was rescued by a consortium of Trust House Forte, Midland Bank and the Automobile Association that bought the company from the British Government on 26 May 1972. Midland Bank acquired sole control in 1977. U.S. banking laws prohibited any national banks from owning travel agencies, so the U.S. operations were sold to Dun & Bradstreet in 1975. After restructuring the company and re-entering the traveller's cheque business the company prospered again. During the 1980s Thomas Cook had its most visible business presence in the U.S., including robust travellers cheque sales to regional U.S. banks. The company had enough business critical mass to set up a computer centre near Princeton, New Jersey. Robert Gaffney and Samuel Malek were two of the notable decision-makers in that era. Robert Maxwell bought substantial holdings in the company in 1988. He was expected to sell his holdings quickly as he was a publisher rather than a travel agent. However, when Crimson/Heritage purchased the U.S. division of Thomas Cook for US$1.3 billion in 1989, he still maintained a substantial interest in the company until his death. In June 1992, following the acquisition of Midland Bank by HSBC, Thomas Cook was sold to the German bank Westdeutsche Landesbank (WestLB) and the charter airline LTU Group for �200 million. In September 1994 American Express (Amex) bought the corporate travel interests of Thomas Cook Travel Inc. which represented about ten percent of the British company's total revenue. However Amex was not able to buy the venerable Thomas Cook name; an American Express affiliate, Cook Travel Inc. had been operating under that name since 1991 in the United States. Due to contractual difficulties LTU Group sold its 10% shares to WestLB in May 1995. During 1996 the company bought short-haul operator Sunworld and European city-breaks tour group Time Off. Within three years the company had combined Sunworld, Sunset, Inspirations, Flying Colours and Caledonian Airways into the JMC (for John Mason Cook) brand. On 2 February 1999 the Carlson Leisure Group merged with Thomas Cook into a holding company owned by West LB, Carlson Inc and Preussag Aktiengesellschaft ("Preussag"). However, in mid-2000 Preussag acquired Thomas Cook's rival Thomson Travel and was forced to sell its majority 50.1% stake in Thomas Cook by regulatory authorities. In March 2001 the Financial Services division was sold to Travelex, who retained the right to use the Thomas Cook brand on Traveller's Cheques for 5 years. In 2002 Thomas Cook was acquired by the German company C&N Touristic AG, which later changed its name to Thomas Cook AG. The group is jointly owned by Lufthansa and Karstadt. In 2007 Thomas Cook announced a merger with competitor MyTravel, with the new group to be called Thomas Cook Group plc and listed on the London Stock Exchange. The transaction was completed in June 2007 following competition authority clearance. The new group was 51% owned by Arcandor (new name of Karstadt). Thomas Cook made a controversial business move in 2008, buying out Canadian travel wholesaler IFS Voyages (including Fun Sun Vacations, Intair, Exotik Tours, Boomerang Tours, etc.). In March 2011 Thomas Cook acquired the UK travel insurance and airport parking provider Essential Travel and launched Thomas Cook Essentials. This was followed by a merger with The Co-operative Travel group on 8 October 2011 to create the UK's largest retail travel network. At the 2011 AGM Thomas Cook shareholders mounted a "revolt" over executive bonuses, with only 53.2 percent voting in favour of the remuneration report.